Assuming climbers are able to obtain competitive flight fares all the way into Kilimanjaro International Airport (JRO) this is almost always the best means of reaching us and getting into position to begin your climb or safari. During the process of your booking with us we will request your flight details and will sned one of our drivers to meet your flight. Our driver will usually be wearing a black Team Kilimanjaro T-Shirt and carrying a placard with the name of the main correspondent representing your climb group. Once in the driver’s vehicle the transfer to your hotel typically takes some 40 minutes. 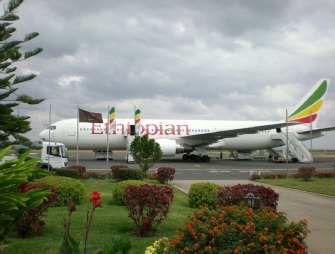 The distance from the airport to central Arusha is 47km. Climbers for whom it is their first time in a 3rd world African country are often surprised and a little dismayed by local driving conventions. For example, it is a very usual practice for three vehicles to be abreast of each other despite the fact of there being only two lanes. It is also the case that pedestrians and cattle are able to walk very close alongside the road - even on high speed sections and at night. In spite of the relatively poor pedestrian facilities, road markings and vehicle maintenance standards of other road users however, we have as yet suffered only two incidents during airport transfers. On one occasion a driver struck a goat, and on another very sad occasion a heavily inebriated man stepped in front of one of our vehicles. The authorities subsequently agreed that the collision was unavoidable. It is advantageous that climbers are aware of such considerations ahead of their decision to come to Tanzania. Luggage Delays. Regrettably, it is very frequent that a climber’s luggage will not turn up on their flight, but will have failed to have made the connection at Amsterdam or Nairobi, or wherever you have had to change planes. We would judge that delayed luggage is suffered by perhaps 1 in 7 climbers, or thereabouts, so please ensure that you travel with your most critical and unsubstitutable items in your hand luggage. You are also strongly advised to wear your hiking boots when you fly as these are the most difficult items to find satisfactory replacements for in the event that your missing luggage does not arrive before your climb starts. In the event that your luggage is delayed, it is most common for it to arrive 24 hours later than your own arrival, but we have sometimes experiences delays of 3 or 4 days. If your luggage has not arrived you will be required to go to the Swissport desk just beside the baggage reclaim area and complete a form detailing what you’ve lost, which hotel you’ll be staying at, and a contact name and telephone number in Arusha. If you are climbing the very next morning after your flight has arrived you will of course be required to improvise replacement equipment to cover your losses. In this event we will require that you please make a list of what is missing during your transfer to your hotel, and to give this list to your driver. Please be as specific as possible. If possible, we will then aim to arrange for a member of our staff to work into the night looking for replacement items for you and will deliver these to you the following morning when we collect you. In some cases it may not be possible to find everything you need and you may need to delay your climb start time a few hours. This will usually mean reaching your first day’s camp after sunset and will require that you have your head torch accessible for the last hour or so into camp. While a small inconvenience, this need not necessarily present any significant disadvantages. Often missing luggage will arrive while you are en route to high camp. In this event we will usually aim to send a runner to intercept you before your summit assault, assuming your luggage has been found in time. Where luggage delays incur additional costs please remember to request a receipt for these as your travel insurance will usually cover these costs. You may also need to request a letter from your climb coordinator, confirming the events that have necessitated your claim. Late Drivers. Occasionally, a driver may be delayed but this is extremely rare, happening perhaps 3 or 4 times a year - either because of a puncture en route to the airport, because of a truck accident temporarily blocking the only east-west road between Arusha and the airport, or because of a flight delay for a previous scheduled pick-up. Where however this does occur we ask you to call us on our Arusha number (+255 787 77 5895) as soon as you have scanned the entrance and have assured yourself that our driver is definitely not there. In this event we will usually be able to contact a reserve freelance driver based at the airport and will arrange for him to find you quickly. Where this is not possible we will ask you to use one of the authorised taxi-drivers from the airport to transfer you to your hotel. These drivers are screened by airport security who only allow bona fide taxis through the main airport entry barrier. Most drivers will agree for us to pay your fare on arrival at your hotel, in which case we will usually send a TK representative to meet your driver at your hotel and will pay his fare. Where a driver does not agree to this we will reimburse you for your fare as soon as we make contact with you at your hotel. Most climbers arriving into Nairobi will use the Riverside Shuttle Bus to transfer to Arusha. There are however, only two shuttle bus departures daily, one at around 0800 and the other at around 1400. If therefore your flight is not scheduled to arrive into Nairobi before 1300 it will most likely be necessary for you to transfer into Nairobi City to spend a night, before taking the morning shuttle from there to Arusha. If you are required to spend a night in Nairobi we advise that you stay at the Comfort Hotel as it has a safe reputation and is just across the road from where the shuttle bus departs, see the map here. As regards the transfer from Nairobi Airport to the Comfort Hotel, you can either ask us to book this with the hotel (in which case we will need your flight code and arrival time) or you can simply get an authorised taxi from directly outside the front entrance of the Arrivals terminal. Please do not walk with a local catcher to an area away from the main entrance as this option may not be safe. Please ensure you enter a vehicle that is waiting in the queue directly outside the main entrance. These vehicles are screened by Airport Security and are licensed by the government to carry passengers. If your flight reaches Nairobi early in the day we would recommend that you arrange with your climb coordinator to book you seats on the scheduled shuttle bus. Although booked and with your name on the passenger list, you will be required to pay for your seat in cash in US Dollars. The price will usually vary between USD 25 and USD 40. If using the shuttle bus transfer service please ensure that you are waiting in position at least 15 minutes before the departure time, so that the conductor has time to stow your luggage. The transfer to Arusha takes around 5-6 hours and includes a refreshment stop a few kilometres before reaching the border, and a 20 minute stop for customs formalities at Namanga border, where you enter Tanzania. If transferring from Nairobi to Arusha and you are booked into a central Arusha hotel (ie. The Arusha Hotel, The Outpost Lodge, L’Oasis Lodge, The Impala Hotel, The Arusha Naaz Hotel, or Le Jacaranda) please detail your shuttle bus driver to drop you off at your hotel. In some cases you will not need to change vehicles to do this, however sometimes Riverside will ask you to switch to a smaller car once the shuttle reaches its terminal (which is currently at La Meza Luna beside The Impala Hotel). If arriving from Nairobi into Arusha and you are booked into a hotel outside Arusha (ie. Onsea House, Moivaro Coffee Lodge, Arumeru River Lodge, Arusha Coffee Lodge) you will need to advise TK of your arrival time into Arusha so that we can dispatch a driver to meet your bus. Please however be aware that shuttle buses are sometimes ahead of schedule and that while we generally have our drivers in place ahead of time, if your bus is particularly early you may need to wait a few minutes for our driver. If flying into Dar es Salaam and wishing to reach Arusha we would generally advise that you fly, if budgeting constraints permit. This is usually very simple to arrange via Alternative Airlines’ website. If however you choose to use the bus from Dar es Salaam to Arusha please be aware that this 646 km journey may take up to 10 hours and that you will be exposed to driving techniques with which you may feel uncomfortable - particularly if you are unfamiliar with 3rd world country driving customs. Arguably the best and safest means of arranging this transfer - or overland transfers from elsewhere in East Africa - is through Scandinavia Express. You can book a seat on this service on their website. The website may appear out of date but was current when this TK page was published. It may not be possible to know accurately what time your bus will reach Arusha. On arrival at Arusha’s Central Bus Terminal you may therefore wish to arrange a taxi transfer from the Terminal to your hotel however please ask your shuttle driver for advise and assistance with this. The fare should be around USD 5 for a central Arusha hotel, or some USD 20-30 if staying at say, Moivaro or Arumeru. Alternatively, if you have your mobile phone with you it is advisable to ask your driver for an ETA once you have passed Moshi and to then call us on +255 787 77 5895 to request a scheduled pick-up by one of our drivers. Unless your shuttle bus driver has supplied additional help and advice, it is not necessary to tip a shuttle bus driver. However please note that when using all other vehicles for transfers it is customary to tip the driver. Tips for short transfers within Arusha tend to average some USD 1-3 to the driver. For longer journeys, such as airport and mountain transfers, these tend to be around USD 5-10 to the driver. If time constraints permit it is advisable to allow for a day’s leisure to be spent in Arusha prior to your climb. This is because a) some climbers become slightly dehydrated or tired from their flights and will therefore benefit from a relaxed day and two nights’ sleep spent locally before beginning a climb, and b) luggage that is delayed will most usually arrive exactly 24 hours late, so if a day is in hand before the climb starts there will be no complications with acquiring replacement gear at the last minute. If you do choose to spend a day in Arusha you are of course at liberty to simply wander into town from your hotel on your own. If however you wish to have someone to assist you in showing you the sites such as the local market, some crafts and souvenir shops, etc please advise us and we’ll send a guide round to meet you at your hotel at the time that you request. The cost to have a guide assist you will be USD 20 if walking, with additional changes if transport is required. A phenomenon of which you should be aware is that when out and about in East Africa it is very common indeed to be approached by ‘fly catchers’, local people who are aiming to make commissions by assisting you in buying anything from small souvenirs and pieces of locally-mined Tanzanite, to another safari with a local operator. Many climbers have described such attentions as annoying and unwelcome. This factor should be considered when deciding whether you wish to move alone through town or request the assistance of a Team KKilimanjaro guide who will be able to fend off any unwelcome attentions. Another interesting way to spend a spare day is by taking a day safari to Arusha National Park, just 30 minutes east of Arusha, where you will be able to visit three distinct vegetative zones, have excellent views of Mount Meru (assuming good weather), and also see a handful of game; notably giraffes, buffalo and perhaps some elephant. Game viewing is undoubtedly better however if you wish us to assist with a day trip to Lake Manyara or Ngorongoro Crater, but the latter option is not recommended to be done in a day as it requires 6 hours of the day to be spent in transit. For groups of 3-5 people, a day trip to Lake Manyara is however perfectly viable, necessitating around 3 and a half hours in transit. If your flight details or overland transfer arrangements ensure that you are in your hotel prior to 1800 on the evening immediately preceding the morning on which you are scheduled to begin your climb, and if you are staying at a central Arusha hotel, we will send your guide (or in some cases an assistant guide) to come and brief you at your hotel at 1800. The briefing assumes that you have spent time familiarising yourself with your route overview and other information available on our website and so should not require much of your time, but you are warmly invited to ask the guide to elaborate on any aspects of the brief that will assist you with last minute preparations or put your mind at rest about anything that you have as yet not managed to resolve. If your flight or overland transfer arrives too late to ensure that you are at your hotel by 1800 on the evening immediately preceding the morning on which you are scheduled to begin your climb, or you have elected to stay at a hotel outside Arusha (ie. Moivaro, Arumeru, KIA Lodge) you will only be briefed by your guide when he collects you at 0730 on the morning of your climb, or on the bus journey while in transit to the mountain from your hotel. This is to be at his discretion. Please note that if you know that your circumstances will disallow a pre-climb briefing on the evening before your climb, you are strongly advised to liaise in detail with your climb coordinator before flying to Africa, over any aspects of concern you may have about your kit, as there will usually not be any opportunity for the guide to either check your kit or obtain any replacement items, as this would impose delays on beginning your climb, and other climbers who have succeeded in completing their administration ahead of time, will usually be disappointed to have such delays imposed. If you are in any doubt about the adequacy of any of the equipment that you have brought with you, please request that the guide checks through your kit and offers his advice. If he judges any item of your kit to be inadequate he will then be able to liaise with the TK office and arrange a last minute kit hire request to be ready to be delivered to you at 0730 the following morning when he collects you. During your booking phase you will normally have been invited to advise us whether you wish to hire any items of kit from us for use on your climb. If you have submitted a kit hire request form our usual procedure is for the guide to deliver this to you when he comes to brief you at 1800 on the evening immediately prior to your climb. On rare occasions this is however not possible, in which event your kit hire will be delivered to you when you are collected at 0730 the following morning. If this happens please don’t concern yourself overly about the implications of having to ensure that there is sufficient space in your holdall or rucksack to accommodate these items of gear, as your guide will always be able to improvise a porterage technique that will accommodate these items if it is not possible to fit them into your bag when you make final adjustments at the national park boundary gate while queuing to register the details of your climb. Also, in just the last few months we have seen a sharp increase in petty thefts and muggings in Arusha. Until last year we were aware of only two visitors who had been mugged. Just this year however, there have been three separate incidents so far. Again, this is still a low ratio overall, but climbers are advised to use taxis when they travel from their hotels, rather than walking on foot, particularly after dark, and we advise that only pocket money is carried, with main valuables remaining inside the hotel’s safe. 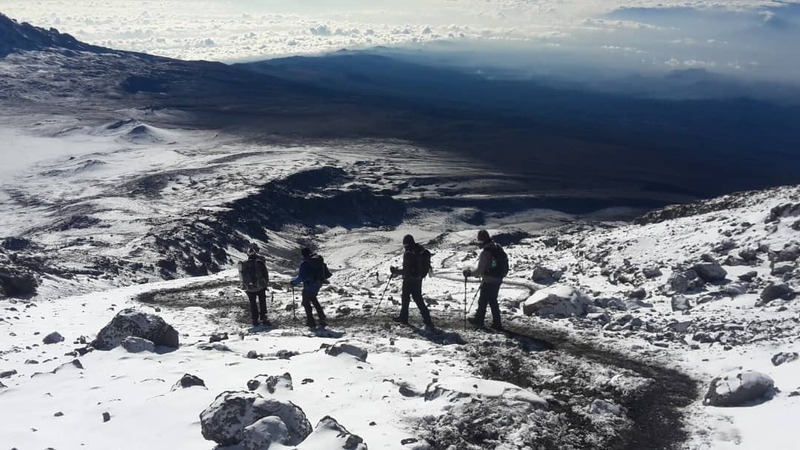 What's it like on Kili with TK?